Whether it’s spring break, summer vacation, or a winter getaway, for families with a special needs child, it can be difficult to imagine leaving the comfort and routine of your home for even just a long weekend. While vacations should be a time of relaxation and fun, for a family with a special needs child, they can be stressful to manage. Planning a trip can seem so daunting, in fact, that you opt out of even going on a family vacation at all. Plan ahead. If you are unsure if a destination will work for your family, or just can’t find the time to plan the trip yourself, there are travel agencies that specialize in special needs travel. Work with them to find a location that will be a good fit for you and your family. Then, make an agenda for each day and give yourself ample time for planned activities. Meltdowns are likely to happen, especially in a new environment, so be flexible. Try going to a place that has everything you want to do in close vicinity, like a cruise ship or an all-inclusive hotel; that way, your room is close if your child needs a break. Know your child’s triggers. Try to be aware of which activities could be a trigger to a meltdown. Bring something that will comfort and calm your child, such as a favorite toy or blanket. If your child has sensory processing issues, try requesting a room at the end of a hallway to help limit the noise of passing traffic. Start with a short trip and work your way up to longer vacations. Try staying overnight at a hotel or a friend’s house that is close by. Let your child adapt to being away from home little by little. With each trip, you will learn from your mistakes and be able to adjust to what works in the future. Consult with your doctor. 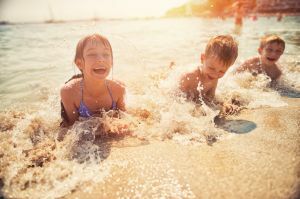 Another way to prepare for a vacation is to make sure your child has the proper medication for travel, as it might differ from what they need on a daily basis. Also, ask your child’s doctor to write a letter describing your child’s condition. This is important especially if your child has an invisible condition such as autism. The letter can help you receive the special accommodations your child may need. Have fun! Remember why you decided to go on the trip in the first place: a family trip is a great way to create lasting memories. Plus, vacations can be very beneficial for those with special needs once they overcome the challenges. It’s important to see what works for you and your family on vacation. You won’t know what part of your plan will or won’t work until you actually book that trip and go! Lastly, don’t get down on yourself if things don’t work out as planned. Each time you try, you’ll learn a bit more about what works and what doesn’t, and this will increase your chance of success. How did you and your family prepare for vacation? What worked, and what didn’t? Let us know in the comments! With more than 25 years of experience in the fields of psychology and education, Marjan Naghavi, associate director of day schools, oversees all of Sheppard Pratt Health System's educational programs spread throughout 6 counties within the state of Maryland. An active member of MANSEF and NAPSEC organizations, she is sought after to assist in the development and evaluation of special education programs for students with disabilities whom exhibit significant behavioral difficulties. Marjan holds 2 Masters Degrees and is currently pursuing her Ph.D. in Education.